A fishing vessel got into serious trouble in Hinlopen Strait in northern Svalbard, as the SAR central in north Norway informed. The Norwegian ship “Northguider” had raised the alarm at 1322 hours (local time) today (Friday), whereupon the SAR machinery in Longyearbyen and north Norway was put into operation. Soon, both rescue helicopters went up in Longyearbyen, the first one arrived on scene at about 1515 hours, less than 2 hours after the alarm bell had rung in the SAR central in north Norway. At the same time, an Orion aircraft took off from Andøya in Norway. Depending on the exact type, these aircraft may be used in SAR missions for example to search for missing vessels or persons or to survey potential oil spills. 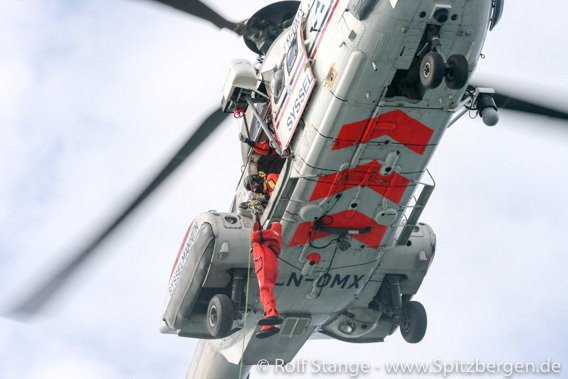 SAR helicopter of the Sysselmannen, here seen during an exercise. But the good news is that all persons seem to be well. The crew of 14 have dressed up in survival suits and gone to the bow area to be picked up by the rescue helicopters. According to the ship owner, all persons are supposed to be well, at least considering the circumstances. Nobody is injured or has been in cold water. The Northguider appears to have hit the ground on the coast of Nordaustland south of Murchisonfjord. She is now sitting on the ground and listing with 20 degrees but the position seems to be stable so far. The weather – about 18 degrees centigrade below freezing, darkness and strong wind (Beaufort 6) – makes the rescue operations challenging, but there is no reason to believe that the Norwegian SAR professionals are not able to get all crew members off soon. Kalkstranda in Hinlopen Strait, south of Murchisonfjord: the Northguider is supposed to have run aground somewhere here. Conditions there are quite different from the photo now, with darkness, cold and wind. The coast guard ship KV Barentshav has set course for Hinlopen Strait, but is not expected to arrive there before Saturday. 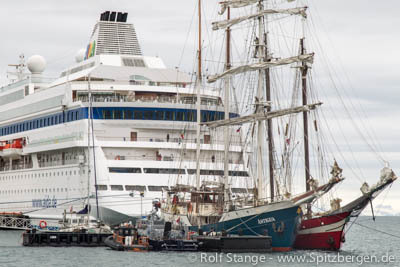 Polarsyssel, the Sysselmannen’s service ship, is not available in Spitsbergen in wintertime. Update: the SAR central North Norway informs that all 14 persons were taken into the helicopters and are by now taken care of in Longyearbyen. The Northguider is still sitting on the ground, taking in water. In 2018, again I had plenty of opportunities to shoot arctic panoramas, making these interesting and beautiful (well in some cases, it is interesting or beautiful) easily accessible for everybody. Physically, most of them are pretty much inaccessible for most people. 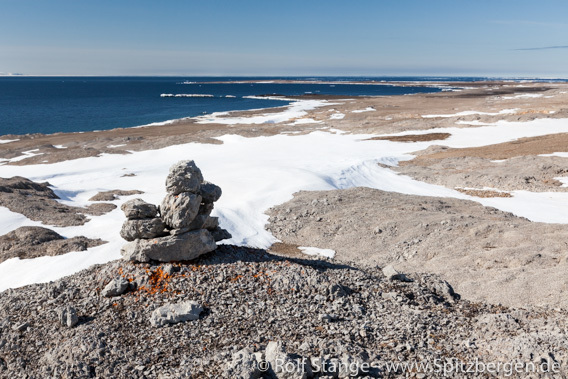 A panorama photo does not physically take you to, say, a mountain top on Prins Karls Forland, but it is the next best thing – it gives you the feeling to be in the middle of the landscape, you can just turn around and enjoy the full view of the arctic landscape. 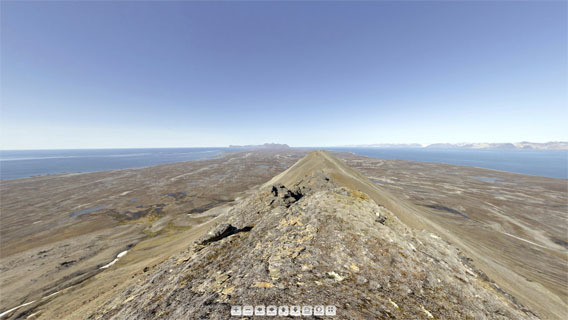 Over 5 years now, the by far largest digital museum of Spitsbergen (Svalbard) has thus come into existance. And it keeps growing. It takes quite some time and effort to turn the 18 RAW files (35, in some cases) into one panorama and to make that part of a dedicated little website or even to turn many panoramas into one virtual tour, such as the school / kindergarten in Pyramiden. In many cases it has taken years for material to progress on the list to the point where it actually appears on the website. (this here is just a screenshot without panorama function). Pyramiden: School / Kindergarten. In October the whole collection of Pyramiden panoramas had moved to a dedicated little map so you can find your way around as you take a little walk through the old ghost town, possibly visiting a building here and there. And we added some new panoramas, including the school / kindergarten, which is our largest single virtual tour so far – the building has 3 floors! Other new ones include the old mines. Let’s get out of the settlements and into the wilderness. Murraypynten is a point on Prins Karls Forland with some fine views. Another one on Prins Karls Forland. Nesungen is on the outer side of the island, which is exposed and rarely visited. Last but definitely not least from Prins Karls Forland. The view on Persiskammen, this lonesome mountain in the south of the island, is just stunning! Elfenbeinbreen in Agardhdalen, not far from the east coast. Buchholzbukta is not far from Heleysund, as far east on the main island of Spitsbergen as you will get. Polhem in Mosselbukta was Nordenskiöld’s base during his 1872-73 wintering. Foxfonna is a little ice cap close to mine 7. Amazing winter views in central Nordenskiöld Land. Rijpsburg on Bohemanflya is not just the site where the first commercial coal mining took place in Spitsbergen. It is also a beautiful place. Finally back again to civilisation. The taubanesentrale (coal cableway centre) is one of Longyearbyen’s eye catchers. Normally it is closed, but here and now … – welcome in! One of Spitsbergen’s most difficult-to-get-to places is the famous Global Seed Vault). Once again: welcome in! Why Santa Claus’ reindeer come from Spitsbergen. And why this can’t be true. Christmas is a time of love, family and healthy food. Presents, trees and… mystery. Or do you know how Santa Claus manages to visit far more than a billion children around the globe? Even if you take those out who have been naughty or who maybe don’t want (or are not allowed to) have anything to do with Christmas – there is still a lot of work to do for the old man. Sharon George of the Keele University in England has done some science to find answers to such questions. She proposes that Santa Claus pulls some quantum physics tricks out of his bag. Just Quantum tunnelling alone may reduce the distance he has to travel by something near 50 %. Do I hear you shout “yes, of course, I should have known”? But still, Father Christmas has to make his way at a breakneck speed of 15,625 kilometres per hour (9,708 mph), to get everything done that is on his impressive to-do list. According to George, he makes good use of bundling the shock waves of the thunder that comes from breaking through the sonic wall. Something happens shortly after some initial scratching of the snow with the hooves by the reindeer, as they have to be 10 times faster than sound to get things done. It is safe to assume that the sledge is made of some nickel-titanium alloy to survive the mechanical challenges that come with such travelling. Friction between air and the nose of the very first reindeer will heat the latter up until it is glowing red-hot, a fact that readily explains some anatomic particulars of Rudolf the red-nosed reindeer. Merry Christmas! Drawing by Norbert Wachter from the book Arktische Weihnachten. So far, so good. But then the scientist makes a mistake as she says that Santa Claus’ reindeer, including the famous, above-mentioned Rudolf, come from Spitsbergen. She argues that only the Spitsbergen reindeer is small and leightweight enough so it can wait on the roof of any house while the boss is kreeping down the chimney to get his job done. Any other – heavier – reindeer would just break through the roof, something that might bring the schedule of the whole operation into some serious trouble. As plausible as this may seem – it can’t be true. Why? This is something that the present author has discussed in his book “Arktische Weihnachten” (German only, sorry!). The relevant text section comes at the end of the book and it is agailable here (click to download). Just in case you don’t read German: reflect for a moment about when male reindeer shed their antlers. Yes, it’s after the mating season, which is in late September and into October. This means that male reindeer from the northern hemisphere don’t have big antlers at Christmas. Rudolf and his colleagues have to come from the southern hemisphere! Where would that be? Well, the whalers introduced Norwegian reindeer to South Georgia. But there, they were killed off some years ago. A stock was, however, preserved in the Falkland Islands. So the simple truth is: Santa Claus’ reindeer come from the Falkland Islands! And so does probably the man himself, as he has to take care of his reindeer also the rest of the year, doesn’t he? The man who tried to rob the bank in Longyearbyen on Friday is a 29 years old Russian citizen who does not live in Longyearbyen, as the Sysselmannen stated in a press release. The man is now in Tromsø for an initial 4 weeks for investigative custody. First details about Friday’s bank robbery: The offender is a 29 year old Russian and not a local. The prize is confiscated, it is said to be a sum of NOK 70,000. 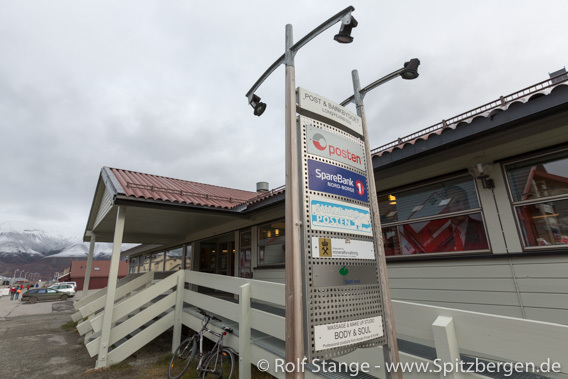 During the hold-up, the man had threatened the 3 bank employees with a Mauser rifle which he had legally rented in Longyearbyen. Weapons of this type are commonly rented by tourists from local weapon dealers for polar bear protection. Next to bank robbery, the man is now also accused for violation of the weapon law and threatening with a firearm. No further information regarding the offender or the deed have been released as of now. Sysselmann Kjerstin Askholt regrets in a statement that types of crime are now observed in Longyearbyen that have previously been unknown locally and that crime is developing together with the general changes of the local society on Svalbard. No, this is not a joke, unfortunately: there was a bank robbery in Longyearbyen today (Friday, 21 December). The alarm went in the Sysselmannen’s office at 10.40 local time. One man entered the bank with a firearm and brought some cash in his control. There were only employees in the bank at that time. These took proper action and managed to activate the alarm, as the Sysselmannen told Svalbardposten. 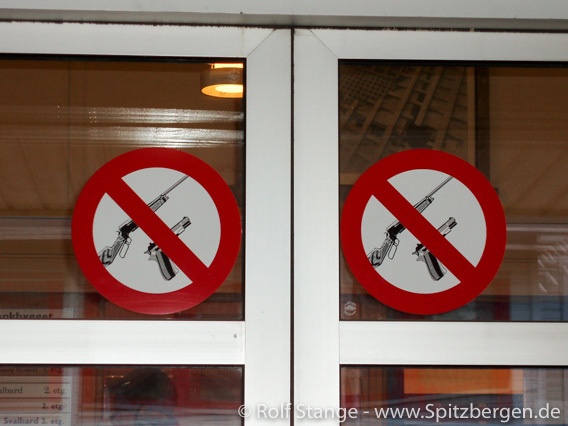 It is actually forbidden to enter the building with the bank in Longyearbyen with a firearm. Today, there was a bank robbery. Nobody was injured. The bank robber was soon arrested by the police, he still had the money with him. He is not of Norwegian nationality and was taken to see the medical doctor, but police questioning is expected to begin later today. Update: it was not a local resident. The man will be taken to Tromsø today for investigative custody. No further information is available so far. Good news about arctic wildlife populations – do they exist? There is, of course and for good (or, rather, bad) reason, a lot of attention on climate change and how polar bears and other species will cope with life in a world with less and less ice. 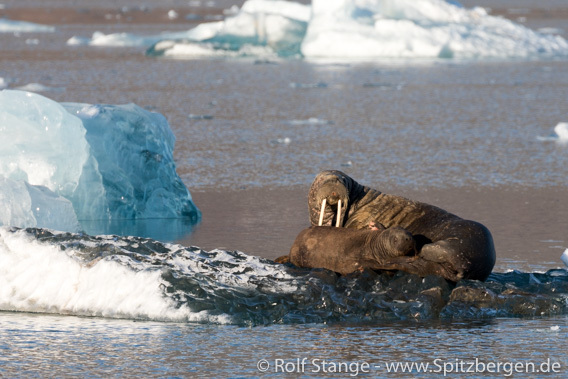 But then there are also walrusses (click here for some general information about these lovely animals). Several colonies in the Spitsbergen area (Svalbard) are monitored with automatic kameras to follow the numbers of animals coming and going. Results so far indicate a growing population and the pleasant observation that walrusses are not bothered by tourists. It is rather the occasional polar bear who is seriously disturbing resting walrusses – these ruthless polar bears just don’t keep the minimum distances. Walrus with satellite sender, Edgeøya. 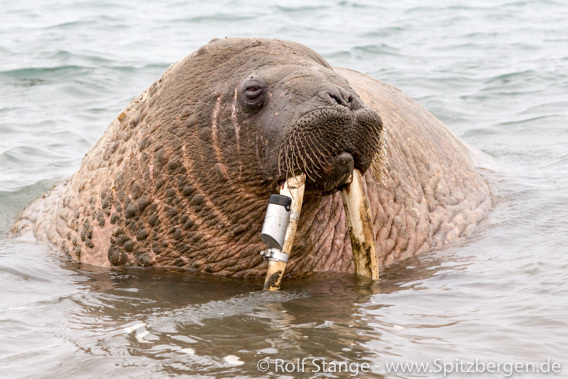 Additionally, some walrus are equipped with satellite senders to follow migration patterns. This is important to establish which percentage of the total population in an area is resting on shore while the others are in the water. Data show that about 25 % of the walrusses are resting on show while the majority of 75 % is swimming. This knowledge makes the number of walrus seen at the colony sites on shore a good indication for the total regional population. Censuses are made roughly every 5 years with small planes equipped for the purpose. They follow the coastline in an altitude of 1000 feet (a good 300 m) while taking photos. Previous counts were made in 2006 and 2012 and the most recent one followed in August 2018. All colonies are surveyed in a time frame as short as possible to make sure individuals are not counted twice ase they may make visits to friends and colleagues at other resting places. 86 colonies were surveyed in Svalbard in August 2018. The number of walrus observed varied from 0 in many cases to a maximum of 269. And what is the result? 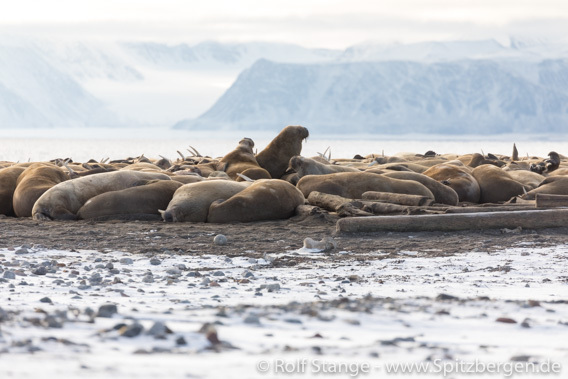 The number of walrusses present in the whole of Svalbard in August 2018 was estimated between 5031 and 6036 individuals. Nailed down to one figure, the population size is 5503 animals, as was reported noy by Christian Lydersen, Magnus Andersen, Jade Vacquie Garcia, Samuel Llobet and Kit Kovacs (Norwegian Polar Institute) in an article in Svalbardposten. This is 42 % more than counted the last time in 2012. A very positive development! But no surprise if you consider that walrusses were hunted almost to regional extinction until protection finally came in 1952. The current growth of the population is still a reaction to the end of hunting, just as with the polar bear population in the same area. Walrus cow with calf: beautiful symbol for a growing population. It will, however, take many more decades before the population will be even remotely near original levels, if this ever happens again. There are still those who think that Longyearbyen is a lonely, silent place where a few coal miners and trappers live. Reality is quite different: there is a well-established and vibrant cultural scene. Next to some very active local clubs and artists, there is a number of festivals and events that have by now established international reputation. This includes the Jazz Festival and the Dark Season Blues Festival (both in the beginning of the polar night) and events such the Ski Marathon and Spitsbergen Marathon, which all attract large and still growing numbers of visitors from many different countries. But rock legends who have filled the largest venues of the globe for decades do usually not have Longyearbyen on their tour plan. This will change in June 2019 when Robert Plant comes to Longyearbyen for two concerts. Plant became a rock legend with the band Led Zeppelin in the 1970s. Following “Zep’s” breakup in 1980, Plant has remained an active musician to this day. On 27 and 29 June, Robert Plant and his band Sensational Space Shifters will be live on stage in the Kulturhuset in Longyearbyen. This is, according to Svalbardposten, a result of the work of a year of Jim Johansen and his company Walrus AS. A key factor for the success of the negotiations is said to be Plant’s personal curiousity about one of the northernmost concert locations in the world (possibly outstaged by Pyramiden – maybe they get the Rolling Stones on stage there in 2030 or so?). It has almost become a painful tradition: the evacuation of dwelling houses in Longyearbyen at times of avalanche risk. The white danger was brought back into public attention very abruptbly in December 2015 when a snow avalanche from the mountain Sukkertoppen destroyed a number of houses and killed two people. Further houses were destroyed during another avalanche in February 2017; this time, it was only a matter of luck that nobody was hurt. Since then, measures are taken to prevent further accidents, including rather drastic ones. Avalanche protection constructions have been established on the slopes of Sukkertoppen. The destroyed houses were not repaired. On the contrary, nearby houses are now regularly evacuated at times of avalanche risk. Depending on the risk at each individual address, some houses are only evacuated when there is an acute risk, while others are closed during the whole avalanche season. On Thursday (29 November), an avalanche warning was issued on varsom based on weather forecasts that predicted a lot of snow. 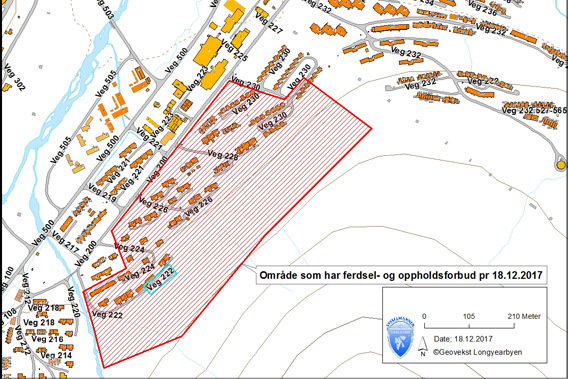 Consequently, the Sysselmannen reacted by issuing evacuations for a number of houses. Evacuation map of December 2017. The houses closed last Thursday were within the same area. Some evacuations have already been lifted based on a new avalanche risk evaluation by NVE, the Norwegian authority responsible for managing avalanche risks (who release warnings on varsom.no). Others will be kept up during the whole avalanche season. Visit the Sysselmannen’s website for information on which addresses are concerned. Nach einer neuen Gefahreneinschätzung durch NVE sind die Evakuierungen teilweise bereits wieder aufgehoben worden. Besonders gefährdete Häuser in den Wegen 222 und 226 werden aber von nun an über den gesamten Winter gesperrt bleiben. Genaue Informationen zu den betroffenen Adressen gibt es bei Sysselmannen. It is up to those concerned to find new accommodation – not an easy task considering the difficult housing market in Longyearbyen.